Meet Eva Monheim. She has empowered thousands of people with her engaging approach to teaching. With her degrees in Art and Horticulture from The Pennsylvania State University, Eva laid the groundwork for her life-long learning and teaching career. Her floral shop, Eve’s Floral Creations, in Glenside, Pennsylvania provided the venue for creating arrangements for weddings, parties, and other social functions for over twelve years. 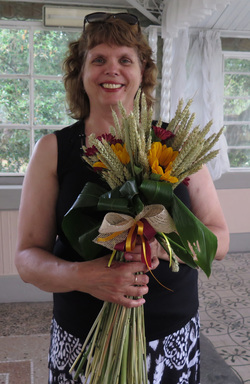 When she chose to close the shop, Eva continued to teach design and other horticultural subjects at Delaware Valley College for five years and for fifteen years, Eva taught floral design at the Philadelphia Flower Show and organized the lectures for other florists too! She eventually headed back to school to get her Master’s Degree in English from Arcadia University. While completing her Master’s Thesis, Eva won the prestigious Ambassadorial Scholarship through the International Rotary Foundation. She spent an academic year at the University of Reading in England where she studied horticulture while completing her Master’s Thesis on how landscapes affect the minds of writers. While abroad, Eva continued to lecture and do presentations to Rotary Clubs and to academic audiences. She has taught at the New York Botanical Garden, and Morris Arboretum and is currently a full-time lecturer at Temple University in the Department of Landscape Architecture and Horticulture. Eva also teaches arboriculture and woody plants at Longwood Gardens in their Professional Gardener Program. Eva is a certified arborist through the International Society of Arboriculture (ISA), a Master Floral Designer through the Florist Transworld Delivery Association (FTD), a certified Tree Steward, and a certified Reiki Master Teacher. As a lecturer at Temple University, Eva continues to inspire her students. To check out some of her students' research and testimonials, go to the About tab in the navigation bar and view the tab titled Testimonials or Student Research.